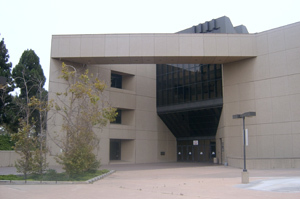 Located in the City of Chula Vista, the South Bay Detention Facility (SBDF) is situated four stories beneath the South Bay Regional Justice Center and opened for service to the community in 1982. It is a non-booking facility consisting of two detention levels. SBDF has a Board of State and Community Corrections (BSCC) rated capacity of 386 inmates, consisting both high and low-level inmate classifications. SBDF maintains a track record as being one of the safest facilities for both inmates and staff. It consistently records some of the lowest crime rates per population. Thus, inmate morale is higher and incidents involving injuries to inmates and/or staff are minimal. As one of San Diego County’s less populated detention facilities, SBDF can be managed by a dozen deputies and a Watch Commander. A full complement of professional support staff helps keep the facility running efficiently. A professionally trained medical staff treats inmates for minor afflictions and illnesses. Detention Processing staff manage the inmates court appearances and assist the friends and family of inmates to coordinate visitation, financial transactions, and bail. SBDF provides a wide range of services to assist inmates in preparation to rejoin society as productive, law-abiding citizens. A full-time counselor is staffed to address individual needs and coordinate recovery programs for the inmates to attend. Inmates are encouraged to attend Narcotics Anonymous and Alcoholics Anonymous meetings conducted by certified instructors who come in and provide bilingual services. Church services and bible study are also provided to the inmates in both Spanish and English.